The Alabama Writers Hall of Fame will induct nine authors in its second class this fall. Jeanie Thompson, executive director of The Alabama Writers’ Forum, a co-founder of the Hall of Fame, said the next class will again represent authors from a broad range of Alabama history. The 2016 inductees include one born in the 18th century, one born in the late 19th century and seven born in the 20th century. Four of these are living and are invited to the September 29th event in Tuscaloosa. Sequoyah (1760–1845) was born in Monroe County, Tennessee, and lived among the Cherokee nation in North Alabama. His syllabary made it possible for Cherokee spoken language to be codified, and it promoted literacy among his people. He is being recognized for his significant contribution to Alabama letters in a special Hall of Fame category. T.S. Stribling (Florence, 1881-1965) won the Pulitzer Prize in 1934 for his novel The Store, part of a trilogy set in Florence. His short story, “Birthright,” was adapted for the screen as a silent film, with sound added later. Poet and novelist Margaret Alexander Walker (Birmingham, 1915-1998) and fiction writer and memoirist Mary Ward Brown (Hamburg, 1917-2013) both made their mark as writers of the American south. 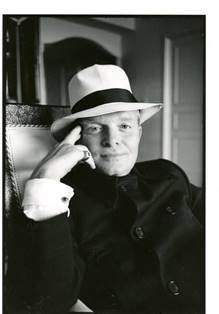 Truman Capote, born in New Orleans in 1924, spent formative years with his extended family in Monroeville. They lived next door to Nelle Harper Lee. Capote and Lee’s association as writers and friends has been widely documented. “We are pleased that our four living authors will be with us,” said Thompson. They include Edward O. Wilson, Honorary Curator in Entomology and University Research Professor Emeritus at Harvard University. Wilson, a world-renown biologist and two-time Pulitzer Prize-winner, has been recognized with scientific prizes across the globe for his advances in bio-diversity, of which he is considered “the father.” Wilson received the 2016 Harper Lee Award for Alabama’s Distinguished Writer of the Year. Wilson is currently boosting conservation of wild lands across the globe and hopes that the plan to develop a National Park along the Gulf Coast will come to fruition soon. Rounding out the list are Birmingham native Fannie Flagg (b. 1944), Falkville native and poet Rodney Jones (b. 1950), and Trussville native and playwright Rebecca Gilman (b. 1965). Flagg is an internationally-known screenwriter and novelist whose work often depicts Southern personalities with humor and compassion. She makes her home in Santa Barbara, California, and Fairhope, and she often visits her home state. Flagg, Jones, and Gilman have all received the Harper Lee Award. Both Jones and Gilman have been awarded prizes in their respective genres. Jones began publishing collections of poetry shortly after graduating from The University of Alabama in the late 1960s. He is recently retired from Southern Illinois University. Gilman has been recognized as a significant American playwright in her own country and in London, where she has had a number of plays produced. She makes her home in Chicago, is associated with the Goodman Theatre, and teaches at Northwestern University. Both Flagg and Gilman are graduates of Birmingham Southern College. The Alabama Writers Hall of Fame was founded in 2014 through a partnership between the Alabama Writers’ Forum, a statewide literary service nonprofit, and the Alabama Center for the Book, housed in the University Libraries at The University of Alabama. “The mission of the Alabama Writers Hall of Fame is to generate awareness of literary works written in Alabama from the early days of our state to the present," said Donna B. Adcock, director of public relations, Alabama Center for the Book. The nine Alabama authors will be inducted during a gala dinner at the Bryant Conference Center in Tuscaloosa on September 29, 2016. Tickets go on sale April 14, 2016. For information contact Emily Burnett at ekmims@ua.edu. Other plans for the Alabama Writers Hall of Fame include an interpretive exhibit suitable for a number of public venues and the development of public programs and educational curricula associated with the Hall of Fame. Support for the Hall of Fame outreach has been provided by major presenting sponsor Books-a-Million (BAM!) and grants from the Support the Arts Car Tag Fund, and the Alabama Humanities Foundation. The Alabama State Council on the Arts provides operating support to the Alabama Writer’ Forum for public programming and service to writers statewide. The Alabama Center for the Book is an affiliate of the National Center for the Bookat the Library of Congress. It was established in 2000 at Auburn University and relocated in 2010 to The University of Alabama Libraries. The Alabama Writers’ Forum, a statewide service organization and partnership program of the Alabama State Council on the Arts since 1993, has been integrally involved in the evolution of the Alabama Center for the Book since its inception. For author photos, contact Danny Gamble at the Alabama Writers’ Forum at 205-665-7986 or gambledanny@bellsouth.net.